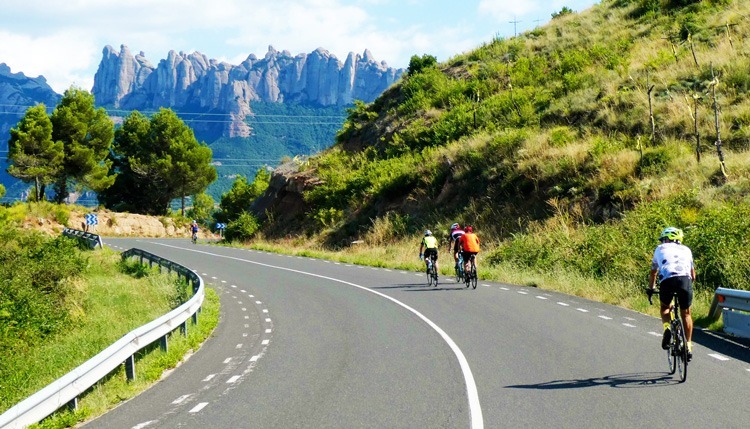 ‘The detailed trip notes ‘ticked all the boxes’ for what was to be our first Saddle Skedaddle experience; A guided road cycling journey across the north-east of Spain, from Bilbao to Barcelona. Although my wife, Sue, and I had been to Barcelona before, this trip would take us to previously unvisited parts of Spain, including Bilbao and the remote foothill regions of the Pyrenees connecting the two autonomous and fiercely proud regions: The Pais Vasco (Basque Country) and Catalonia. We arrived in Bilbao one day early to facilitate some sightseeing and soon realised that a future return trip would be needed to fully appreciate all this region has to offer. We found the locals to be so friendly and buildings were adorned with banners saying “Ongi Etorri” which we later learned means “Welcome” in Basque. Personally, I could see many similarities, geographical, historical and cultural, between Bilbao and Newcastle Upon Tyne, the city that both myself and Saddle Skedaddle call home. 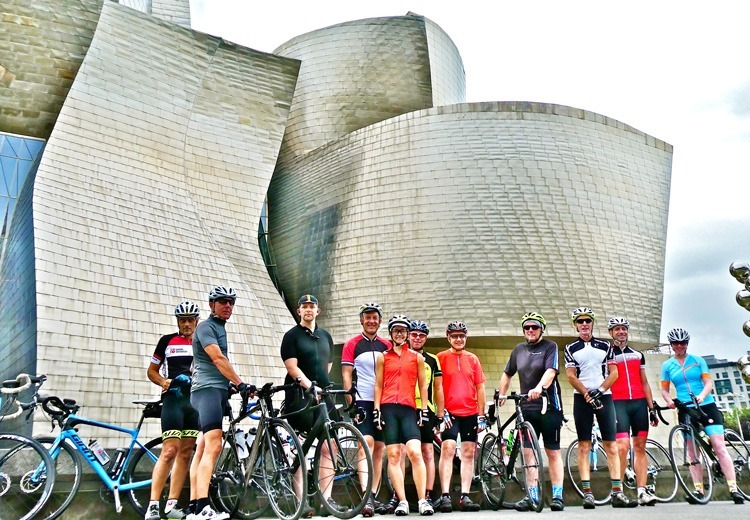 We joined-up with our fellow cycling companions, a small group of ten riders in all, and met our three guides in our Bilbao hotel the night before the trip’s departure. Over a beer, the lead guide wetted our appetite for what was in store for us over the coming eight days. The next day, after a hearty breakfast and informal briefing we abandoned the hotel on a cool, overcast morning and made our way through streets of Bilbao to its landmark building, the Guggenheim Museum, for an obligatory group photo. Then we were off, heading along the banks of River Nervion eastwards past the old quarter of the city, bound for our first climb of the trip out of Bilbao. The first day established the daily routine for the trip; breakfast (at a respectable hour!) 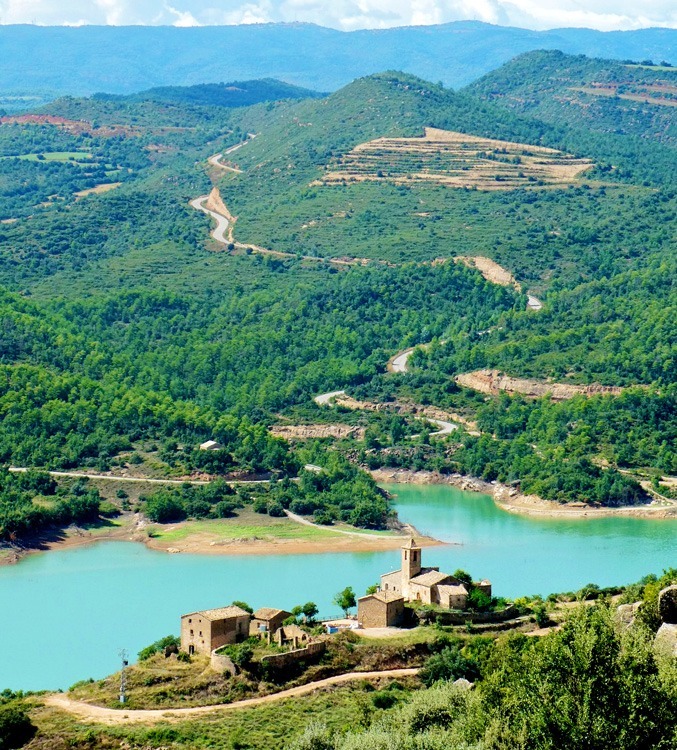 and pre- departure briefing, morning coffee stop, picnic lunch, evening dinner, interspersed with periods of cycling on quiet roads through some of the most scenic, undulating terrain that Spain has to offer. Our guides worked hard throughout to ensure we didn’t get lost, were well fed and watered, and lugged our bags door-to-door from one hotel to the next. The even got their hands dirty doing running repairs and adjustments to our bikes along the way! We were all grateful for the relatively cool weather at the start of the trip, especially on the climbs as we found our cycling legs and got into our rhythm. The weather gradually warmed up however and, aided by a tail wind, we sped along the route, dropping the two cycling guides on the day’s second main climb, ‘Puerto de Opakua’, in the process and triggering feeble excuses such as ‘mechanical bike teething problems’! Lunch each day was a time to regroup, rehydrate, and relax, taking in the beautiful scenery around us. Each day, our guides swapped their cycling helmets for chefs’ hats and somehow managed to conjure up an alfresco feast from the back of the support van, catering to the group’s dietary needs. Hotels were typically situated in a small town or village on the top of a hill, which although afforded some spectacular “rooms with a view”, inevitably meant a “sting in the tail” climb at the end of each day’s ride, testing our fitness and mental resolve. We were most impressed by the standard of the hotels on the trip, which, whilst mostly small with minimal facilities, were all clean, well located, had real character and served-up some great food. We soon passed from the Basque Country into Aragon where Castillian Spanish is the prime spoken tongue and we recognised the familiar greeting “Bienvenidos” on roadside signs. 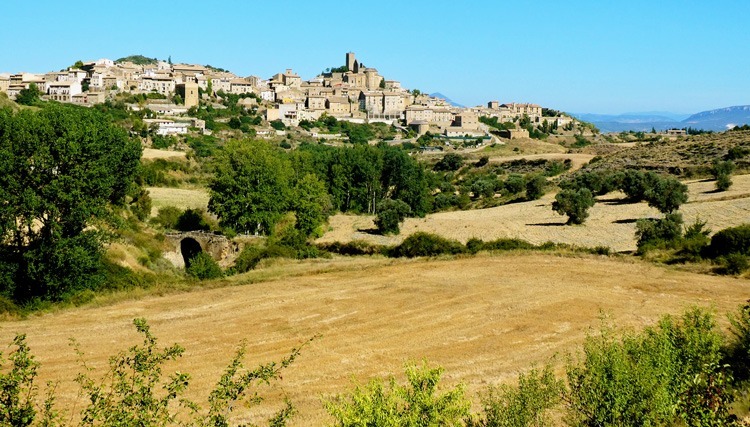 Aragon had a raw unspoiled beauty, being largely agricultural with an abundance of historic buildings such as churches, cathedrals and castles in its villages and towns. On the second night we stayed in Hotel El Peiron in the medieval hill-top town of Sos del Rey Catolico, rightly designated as one of Spain’s most beautiful towns. Dinner in El Lenador (The Lumberjack) was delightful, with rustic food cooked on a wood- fired grill and we all tried drinking wine from a “porron” pitcher without spilling any in the process (easier said than done, even when sober!). Before long we found ourselves in Catalan country and were greeted by signs saying “Benvinguts”. Each day of the trip brought its own highlights and memorable experiences, too numerous to include in this short blog, but the general consensus was that the most enjoyable day of cycling was actually the toughest on paper (i.e. longest mileage and highest ascent); that from the Avellanes Monastery in Os de Balaguer to Oliana (the sixth day in the saddle). Coincidentally, this also fell on our Wedding Anniversary and we celebrated that evening after dinner with a couple of glasses of cava courtesy of our Skedaddle guides – “Salut!”. After a memorable stay in the heights of Montserrat National Park, beneath the jagged granite pinnacles and adjacent to the famous Abbey, we descended towards our final destination on the Mediterranean coast, Barcelona. We enjoyed our final picnic lunch at a view point overlooking the sprawling cosmopolitan city, with famous landmarks such as Gaudi’s ‘Sagrada Familia’ cathedral clearly visible. One hour later we were standing beneath this iconic building for our final group photo, with the photo taker sprawled across the pavement on his back trying to get the ideal perspective for the shot. We had all made it safely and duly celebrated that evening with a group meal in a restaurant overlooking Barcelona’s main marina. There we toasted our own achievement with the customary glass of cava and acknowledged the excellent support from our new “tres amigos”, our Skedaddle guides. Feeling inspired? 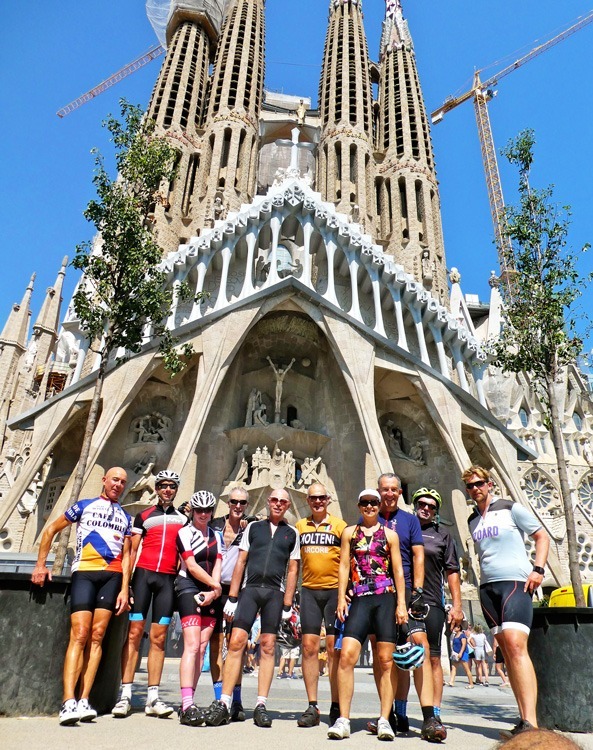 Bilbao to Barcelona trip is a part of our Iconic Journeys range that includes some of the most famous challenges in Europe and the UK. 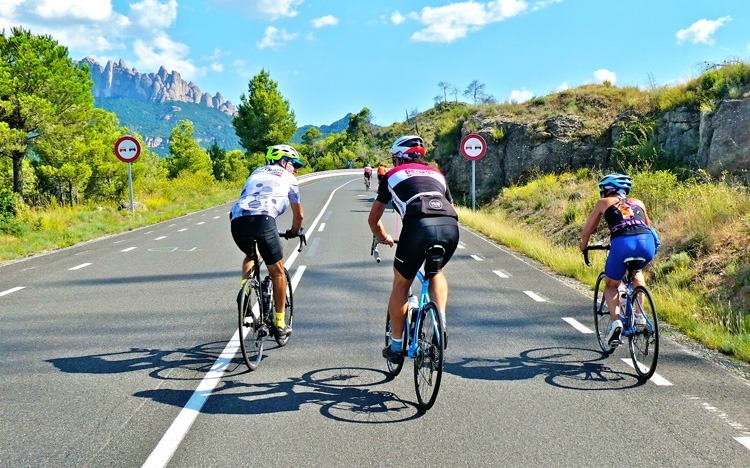 Check them all out here and get in touch to find out how you can join us for a chance to take your cycling holiday to the next level!